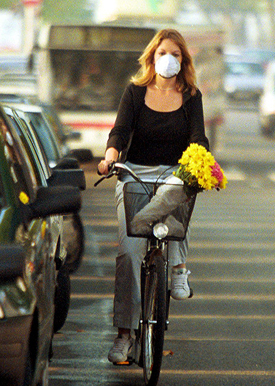 Air pollution causes people to get sick, and illness costs society money. What can Danish society save in health costs due to air pollution by switching to greener energy without fossil fuels? The interdisciplinary research centre, CEEH led by the Niels Bohr Institute, has made scientific calculations of this. The report shows that there would be significant savings for society in a fossil free Denmark, around 2-3 billion kroner annually through 2030. The Climate Commission report from 2010 has produced a series of strategic calculations and economic analyses of how the Danish energy system can be made independent of fossil fuels by 2050. Calculations have been made for two future scenarios: a less ambitious proposal based on wind and solar energy with significant imports of biofuels and a very ambitious proposal based on wind and solar energy with biofuels produced in Denmark. The Commission concluded that additional costs through to 2030 for the two proposals would be between 2 and 5 billion kroner annually. The last push towards a completely fossil-free Denmark in 2050 is somewhat more expensive with additional costs of approximately 9-12 billion kroner annually due to changes in the transport sector including a shift towards electric cars. “All costs and benefits to society were not calculated however. Side effects, such as impacts on health, damage to nature, the degradation of buildings and so on are not included in the Climate Commission’s economic assessments. We have therefore created a model system that assesses the effects on health based on the Climate Commission’s scenarios, and these calculations show that society will save 2-3 billion kroner annually in health costs alone through to 2030. In other words, the expenditures for a gradual shift to cleaner energy are significantly less than the calculations by the Climate Commission show”, explains Eigil Kaas, a climate professor at the Niels Bohr Institute at the University of Copenhagen. He heads the strategic research Centre for Energy, Environment and Health, CEEH. The centre is a collaboration between the scientific disciplines: atmospheric physics and chemistry, health sciences and energy systems analysis. “There are many diseases that can be connected to air pollution, both cardiovascular diseases like heart attacks and strokes, and lung diseases like bronchitis, asthma and coughs along with lung cancer. We have calculated the morbidity and mortality and looked at hospital admissions and absenteeism along with reduced quality of life and generally shorter lifespans”, says Jakob Bønløkke, who is a doctor and associate professor at Aarhus University. He explains that air pollution is comprised of many different components that have an impact on health. For example, the pollution consists of small particles. The particles are airborne and the smallest particles in particular, less than 2.5 microns (a micron is a thousandth of a millimetre), get deep down in the airways where they can contribute to lung disease. There are many sources of air pollution, which consists of gasses and particles that are carried by wind over long distances. In addition to emissions from power plants, there are also emissions from ship traffic and smoke from wood stoves, oil furnaces and from traffic. Using knowledge about the extent of air pollution and its harmful effects on humans, researchers have used a combination of atmospheric transport models and systems analysis models in combination with registers over the location, age distribution and health of the population. “We have made calculations for all kinds of emissions and compared them with their effects on health and the associated costs. For example, the emission of a kilo of sulphur from a power plant with a very high chimney that spreads and disperses the pollution has much less of an effect on health than the emission of a kilo of sulphur from cars, where the emission comes right into our faces”, says Kenneth Karlsson, an engineer and research in energy systems at RISØ DTU. Kenneth Karlsson has primary responsibility for the report and he explains that they are very complicated calculations, because air pollution is not national, but is transported around in the atmosphere and spreads over national borders and affects the economies of many countries. The results from CEEH's report could therefore be included in the international negotiations over commitments to reduce different kinds of emissions. The Niels Bohr Institute at the University of Copenhagen, the Danish Meteorological Institute, the National Laboratory for Sustainable Energy at the Technical University of Denmark (Risø DTU), National Environmental Research Institute (DMU), Aarhus University, the National Institute for Public Health at the University of Southern Denmark, Centre for Applied Health Services Research and Technology Assess-ment (CAST) at the University of Southern Denmark and the School of Public Health at Aarhus University.